For maximum security and long life, choose only the very best components for your chain link enclosure. We offer complete DIY installation packages, based on your dimensioned sketch, that include everything you need. Shipped directly to you from the manufacturer, everything you need to complete the installation, except the concrete for post setting, is included. 9 Gauge GAW fabric, heavy-duty galvanized posts, outstanding hardware, and the gates you choose are shipped as one order. We assist you by making sure nothing is missing in your order, and give you our very best discount pricing. Where appearance is important for your chain link fence project, vinyl coated galvanized fabric, posts and hardware make your installation stand out. At very reasonable additional cost, our direct-shipping fence supply company can provide you with a complete package in black, brown or green colors. You can also choose packages that use vinyl-coated fence fabric with galvanized posts and hardware to create lower-cost hybrid fences. Our vinyl-coated materials are manufactured to the same high quality standards as our regular chain link fences. We will give you highly competitive price quotes on all options, based on your dimensioned sketch. You choose the combination that meets your exact needs. Direct shipping and our deep discounts save you money, no matter which option you select. As the leading supplier of direct-shipped chain link fence packages, we’re also the leading supplier of galvanized pipe and tubing for a wide range of uses. This pipe and tubing is used for railings, boat docks, sign posts, parking lot bumpers, and many other purposes. 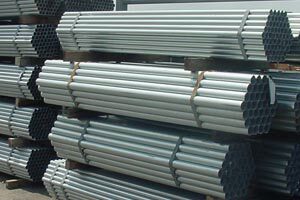 If you need large quantities of galvanized pipe and tubing, let us give you our best low price for materials shipped direct from the manufacturer. We’ll quote you a total discounted price, shipping excluded, based on current market prices. You’ll be surprised at how much you can save, compared with prices from local suppliers. Flanged bottom posts are also available, along with a wide range of hardware and fitting. Hardware and accessories for chain link fences are often a serious problem for builders. Local suppliers don’t always carry every component needed and are often out of stock on the items you need for your DIY project. Unavailable hardware and accessories can bring any job to an inconvenient stop. As a full-service fence supplier, we ensure that every order from us is complete, even if it includes hard-to-find accessories or components. Since all orders are shipped directly from trusted manufacturers, the parts you need are always in stock. Best of all, we give you a cost advantage by passing along maximum discounts, based on our high-volume purchasing. Don’t settle for incomplete orders that slow you down. Call us for complete service you can count on. Barbed wire is often used at the top of chain link fences where maximum security for facilities is needed. Relying on local suppliers for these materials always means limited selection and delays. When your project demands outstanding security for perimeter fencing, let our security products experts assist you. From fence top arms to a full range of barbed wire types, we can supply all of your needs with volume-based low cost price quotes and direct shipping from manufacturers. Call us today and let us help you build an order that meets your exact specifications and is delivered complete and ready to install. Wherever you are located, relying on local suppliers for your DIY installation can lead to inflated prices and unavailable components. Local suppliers may not even know what is involved in your project. Delays and high costs are often the result. 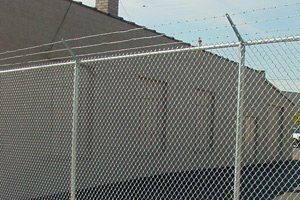 As a high-volume supplier of chain link products, our experts know these products intimately. We ship directly to you from the manufacturer, and assist our customers in creating complete materials lists for every order. Our volume purchasing and long relationships with manufacturers mean that we get maximum discounts. We pass those discounts along to you in our money-saving price quotes for every order. You don’t have time or money to waste, and we understand that. Call us today for the very best in service and quality.